It was a long day of driving but we finally got to Wellington around 6. After finally finding the hotel with many a reprimand from the GPS, we asked the porter for a dinner recommendation. 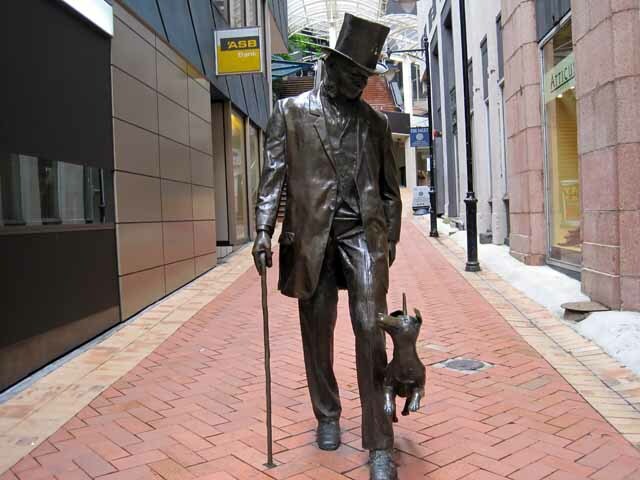 He suggested The Red Dog, which he called ahead for reservations. We decided to walk since Joe had enough of driving in a city on the wrong side of the road. 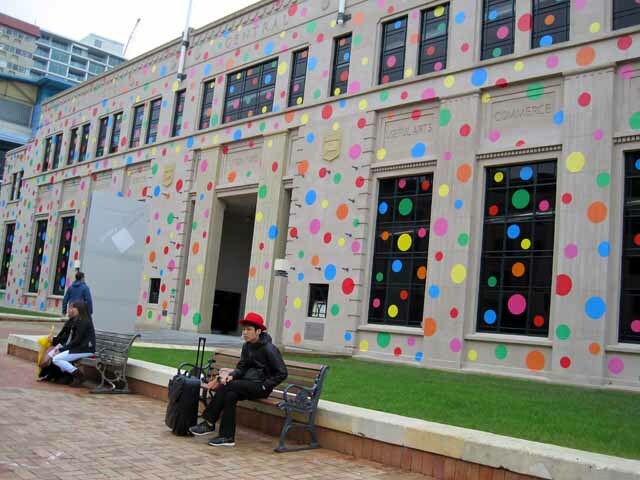 As we were walking to dinner we passed the Wellington Museum of art which currently is covered in polka dots. 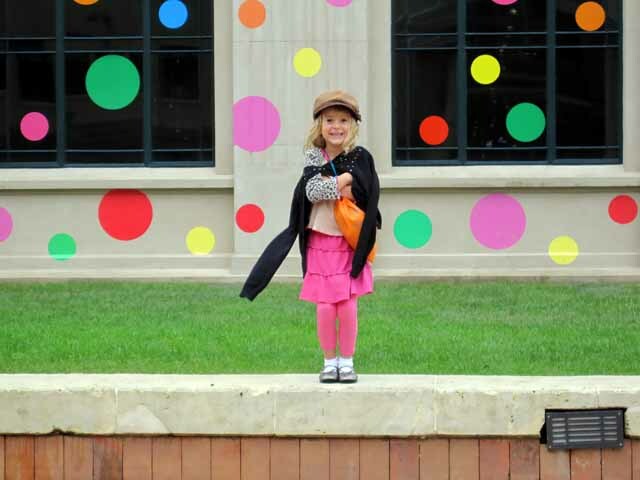 Brigit decided then and there that our first stop in the morning would be the polka dot museum. 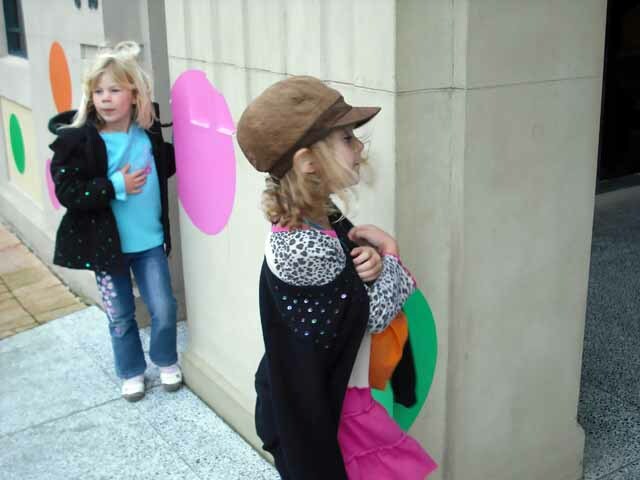 After getting up and dressed and leaving for the museum, we again walked, the girls finally reached code blue cold level. 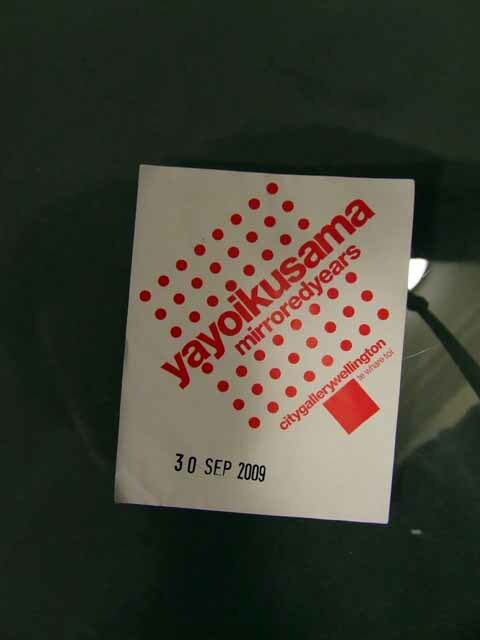 But we arrived at the polka dot museum to discover that the featured artist was yayoi kusama and the exhibit was entitled “The Mirrored Years.” It was equal parts amazing and terrifying. The art was amazing. There were 2 emersion pieces. One was titled “Firefly Room.” It was my favorite. It was also terrifying in that many of the modern art pieces were made up of objects strewn around on the floor and we were there with Brigit. One titled Clouds had me holding my breath the whole way through. It was made up of largish things painted to resemble clouds which actually resembled, well, bean bags. And Brigit was in this room. Yah, so I was worried that we would be asked to leave the country when Brigit decided to bounce on the priceless art piece. We were lucky. Actually the woman who we paid told us to come back and let her know if the girls were good and if they were they would get a prize. So Brigit and Beth Anne left the museum with totes and lollis. 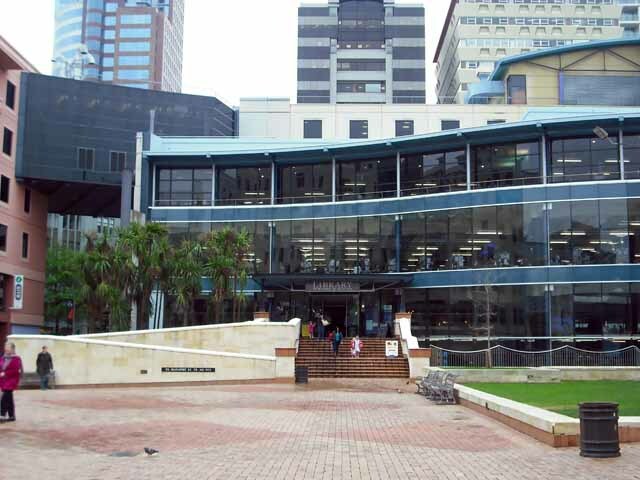 After the museum, we discovered that we were right next to the central city library which we, of course, had to visit. It was lovely. At the main entry there was a cafe where you could sit and have a light meal or tea. 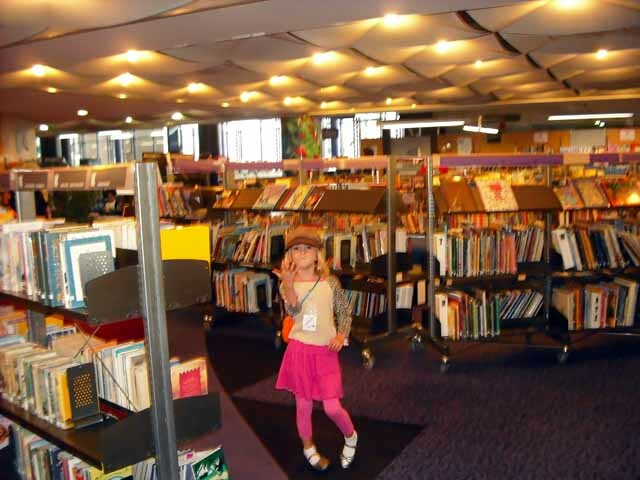 The children’s section was large and well stocked and from the piles of books everywhere apparently well used. Brigit had me read 4 or 5 books and Beth Anne asked me to take the picture of 4 or 5 different books that she wants to read when we get back. The check out system was self serve and the staff was very helpful. I only wish I had had more browsing time. 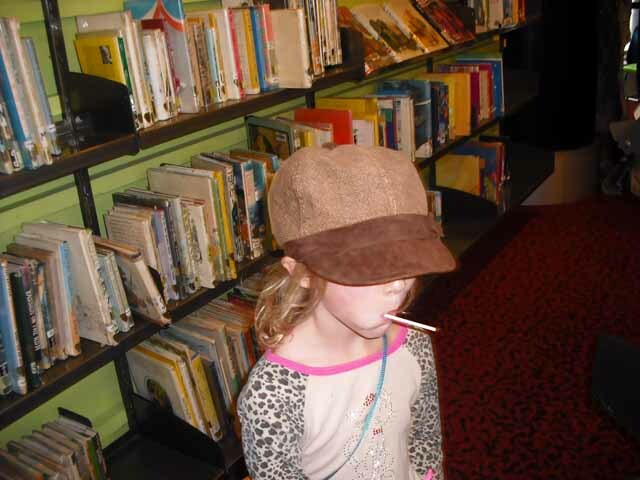 The information staff was quite helpful and because of them we were finally able to find winter outer-wear. Across the street, the gentleman who was working at Dwight’s Sporting Goods store was very happy to see us. 3 hats, 3 pair of gloves and two winter coats later the cold alerts began to stop. This allowed us to march the girls up and down Cuba street, discover again that there are set lunch and dinner times and finally eat some amazingly good and quite expensive Mexican food. I think we could have eaten at Rio Grande 6 or 7 times.